Each summer one of the most highly anticipated events for AEDE’s faculty and students takes place: the annual meeting of the Agricultural and Applied Economics Association (AAEA). AAEA is the premier professional organization for agricultural and applied economists working in the U.S. The yearly gathering brings together the country’s top agricultural and resource economists working in the academic, public and private sectors. 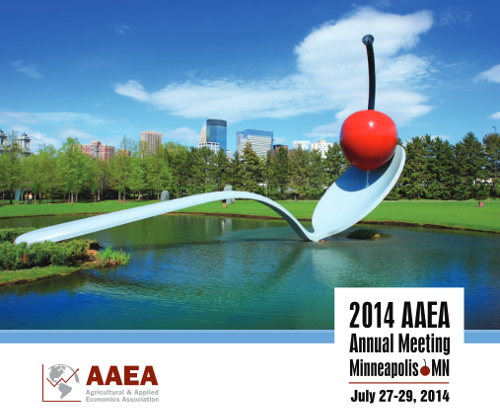 This year’s meeting, which was held from July 27-29, 2014 in Minneapolis, featured over 150 educational sessions, 200 posters on display, and multiple plenary sessions each day. • “Boomtowns and the Nimbleness of the Housing Market: An Investigation into the Impact of Shale Oil and Gas Drilling on Local Housing Markets” by AEDE’s Michael Farren was presented during a session on shale gas and wildfire. • “Certification, Food Quality Standards and Trade” by AEDE’s Ian Sheldon and Brian Roe was presented during a session on food quality and trade. Ian Sheldon also served as the organizer of the session. • “Environmental Economics Priorities for Federal Statistical Data” by AEDE’s Timothy Haab was presented at a session on agricultural and applied economics priorities for government statistics. • “Coupled Coastal Economic Modeling for Climate Adaptation and the Nourishment Dilemma” by AEDE’s Sathya Gopalakrishnan, Dylan McNamara from the University of North Carolina at Wilmington, Martin Smith from Duke University, and Brad Murray from Duke University was presented at a session on climate change adaptation and resilience. • “Is Storage Rational When the Price is Expected to Decline? An Empirical Study Using Data from US Futures and Options Markets” by AEDE’s Carl Zulauf and Sanghyo Kim, as well as “Cooperatives and the Risk Aversion of Farmers” by AEDE’s Jafar Olimov, were presented at a session on prices, marketing, and risk in agricultural finance. • “The Effect of an Information Intervention on the Healthfulness of College Meal Plan Purchases in a Use-it or Lose-it Meal Plan Currency System” by AEDE’s Matthew Pham and Brian Roe was presented at a session on the effects of federal nutritional programs on food choices. • “Financial Services and Divisible Technology Dis-adoption among Farm Households: Theory and Empirical Application Using Data from Ethiopia” by Isai Guizar from Tecnologico de Monterrey and AEDE’s Nicholas Dadzie was presented at a session on land allocation and risk management issues in Africa. • “Estimating the Impact of Water Quality on Surrounding Property Values in Upper Big Walnut Creek Watershed in Ohio” by Hongxing Liu from Ohio State, AEDE’s Sathya Gopalakrishnan, Drew Browning from Ohio State, Patrick Herak from Ohio State, and Gajan Sivandran from Ohio State, as well as “Preference Tradeoffs Across Spatial Scales: Developing a Micro Level Sorting Model” by AEDE’s Mitchell Livy and H. Allen Klaiber, were presented at a session on moving beyond hedonic models. • AEDE’s Matthew Pham moderated a session on the causes and effects of farm programs. • AEDE's Wendong Zhang moderated a session on climate and water. • “Parametric Bootstrap Tests for Futures Price and Implied Volatility Biases with Application to Rating Dairy Margin Insurance” by Marin Bozic from the University of Minnesota-Twin Cities, John Newton from the University of Illinois Urbana-Champaign, AEDE’s Cameron Thraen, and Brian Gould from the University of Wisconsin was presented at a session on insurance: empirical issues and implementation. • “An Economic Analysis of “Local” Production: Is it Efficient or Inefficient?” by AEDE’s Eugene Jones was presented at a session on cooperatives and local markets. • AEDE's Steven Vickner moderated a session on farm management. • “Peer Effects and Farmer Heterogeneity in Tillage Choices” by AEDE’s Avishek Konar, Brian Roe and Elena Irwin was presented at a session on agricultural practices to improve water quality: space and time considerations. • “Risk Mitigation from Combining Commodity and Crop Insurance Programs: Evidence from Illinois and Kansas” by AEDE’s Carl Zulauf, Gregory Ibendahl from Kansas State University, and Gary Schnitkey from the University of Illinois at Urbana-Champaign was presented at a session on empirical studies on risk in agricultural and ecological systems. • “Food Security for Whom? The Effectiveness of Food Reserves in Poor Developing Countries” by AEDE’s Randall Romero-Aguilar and Mario Miranda was presented at a session on food security and policy in developing countries. • “How to Publish Academic Papers” by AEDE’s Brian Roe was presented at a session on tips on communicating in an academic setting. • “A Coupled Spatial Economic-Hydrological Model of Cropland Transitions and Environmental Impacts” by AEDE’s Wendong Zhang, Na Chen from Ohio State, AEDE’s Elena Irwin, Seyoum Gebremariam from Ohio State, and Jay Martin from Ohio State, as well as “Linking Farmers’ Nutrient Management Choices with Downstream Environmental Quality” by AEDE’s Wendong Zhang and Elena Irwin, were presented at a session on the economics of production and the environment. • “Trade Costs, Financial Constraints, and Firm Performance in Developing Countries” by AEDE’s Eric Tseng was presented at a session on the costs of international trade. • “It’s Better Than Mothing: Modelling the Optimal Control of Gypsy Moths” by AEDE’s James Goodenberger, Sathya Gopalakrishnan, and H. Allen Klaiber. • “Adverse Gaming Incentives in Future Farm Safety Net Programs: Evidence from the Milk Income Loss Contract” by John Newton from the University of Illinois Urbana-Champaign, AEDE’s Cameron Thraen, and Mark Stephenson from Cornell University. • “Do Remittances Alter Household Nutrition? Evidence from Rural Kilimanjaro in Tanzania” by AEDE’s Rosemary Isoto and David Kraybill.